It is only 7º outside and barely any warmer indoors. I am huddled at my desk with an air heater/blower at my feet so the warm air rises past me. Eventually this small room will warm up. No doubt just before I feel a need to open the door for the calls of nature that the cold seems to make more frequent, urgent and frequently unsatisfying. Not unlike the urgent messages received to lose water just before a run, no matter how often you go, you immediately want to go again. No doubt some residual fight/flight message (residual, not residential, then). If you haven’t discovered the wonders of polypropylene underwear, go find out. Wicking materials, as they are called, have a mixture of weaves that result in successively smaller holes in the cross-section of material as you move from the skin. This means that any moisture on the skin is ‘wicked’ away. To where, one wonders. The outer surface should get smelly rapidly. Fortunately all these materials wash at cold temperatures and drip dry very quickly. When camping, if you really want to do washing, then the clothes will dry on you after wringing (which you’re not supposed to do with most of the materials). Wicking materials come in different weights and for hiking with a sac on your back you need strong (thick) material, because you’ll soon find that this is the only layer you wear, maybe with a wind-proof on top in the cold. I have been out in snow conditions in Wales several times with one wicking and one windproof on the torso and been disgustingly, disturbingly comfortable. Not so at home, stationary and in a damp atmosphere. So what is it that makes one feel ‘cold’? There are medical conditions that are relevant: being underweight, getting older, being stressed and having dietary deficiencies apply to many of us; more rarely, hyperthyroidism (if you’re feeling cold all the time), Raynaud’s disease (syndrome, mid-aged women, goes with tingling in the fingers), hormonal problems (meaning irregularities and changes, so unusually applicable to men). If you want to feel ill, go visit www.wrongdiagnosis.com. That site refers you to comorbidity (co-morbidity; two diseases at the same time) and the paranoid will want to find new excuses for poor behaviour and will collect themselves a (new) collection of illnesses to claim to have. Ignoring these demands for sympathy as self-indulgence, let’s look at how one can be basically healthy and feeling cold. I’m going to lose all the disease and illness words, and though dis-ease, not being easy in oneself, is what we are genuinely describing, the compounded word is taken to mean that we have an infection / illness / morbidity (distinctions welcomed) that requires treatment. I am more interested in understanding how we come to feel cold on the basis that an understanding will give (probably) obvious actions to counter it. In terms of likelihood, hypothermia¹ is the most likely problem. 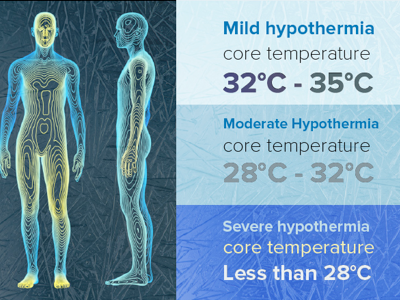 By this is meant the mildest case of hypothermia; your core body temperature has dropped by a degree or two; you possibly had alcohol recently. The solution is to be warm and dry. Dry because damp skin requires more heat loss to counter the dampness. Being cold reflects the body’s attempts to regulate temperature and is the result of heat gain and loss; gains from burning fuel and losses from the local environment. Draughts add to this, dampness adds remarkably to it. Look to ways to reduce heat loss. In my case, the quickest solution is to add a hat. I’m open to suggestions of acceptable indoor hats². Santa’s garb is declared inappropriate, if functional. A yarmulke is a possibility. I found references to treatment of ‘winter dry skin’, presumably among people who are solving the feeling cold situation but replacing it with a new condition, if less worrying), What goes wrong is the loss of protective oils (lipids) in the near-surface skin. Too much washing is a likely cause. Join my campaign against washing (ha ha); wash thoroughly but less often; a short shower is way better than a long bath, but pay attention to the speed of the post-bathing process or you simply get cold all over again. Look at the use of something really simple like Vaseline [key point; a little, well rubbed in]. Domestic vegetable oils work as well, in both senses. Bath oil after the wetting is an often preferred but marginally less effective solution (haha). So; be dry. Look to help the skin not be wet damp but not at the expense of dry skin. Try to avoid unnecessary heat loss. Dress sensibly (which doesn’t mean just more clothes, it means think about what they do). Fix your environment. Except in China, where heating is not allowed south of The Line³, which is far further north than you want to hear about. 1 “No patient is dead until they are warm and dead” underscores the ability to resuscitate patients from hypothermia. Wonderful quote, found in all sorts of government emergency paperwork. 2 Indoor hat also refers to Frisbee leagues, ultimate disc leagues. Etiquette says no hats for gents in non-public areas. Note also that tipping your hat to men is an insult – revisit John Wayne movies (Tom Mix if you’re even older) where he does it and newly understand the move quite differently. Respect to women, disrespect to men. Touching the brim (a salute) is giving respect, tipping it (a brief lift of the hat) is not. 3 The Line is generally that of the Huang He (Yellow River), north of Jiangsu (Nanjing and Shanghai locales). Thus Beijing is north of the line but Xi’an is south of it. The rule says that north of the line your house may be (should be) equipped with a (central, distributed) heating system. South of that line you are permitted the use of air-heating (reverse heat pumps in the a/c unit, typically) but are not permitted a built-in system. This means that south of the line there are no chimney places. Out in the country it is different. For a start, regulation rarely is applied in any sense; second the chimney will be for the cooking fire too – the peasant life still exists for half a billion people. Interesting to research the kang (houqiang); a heated bed floor. See also ondol (Korea), kotatsu (Japan), korsi (Iran), sandali (Afghanistan). Some of these apply to beds only, some to eating spaces, some to more general heating, such as the hypocaust (the ondol, the Spanish Gloria). 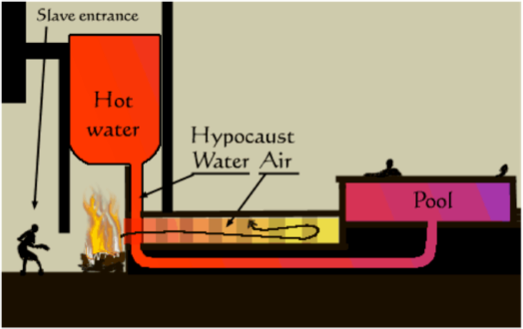 Diagram of Roman hypocaust system. Biggest disadvantage is poisoning from carbon monoxide or dioxide. 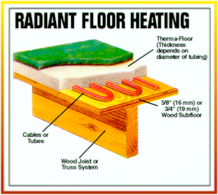 Modern typical underfloor heating system circulates hot water or heats a cable.